The Festival of Lights is coming soon! 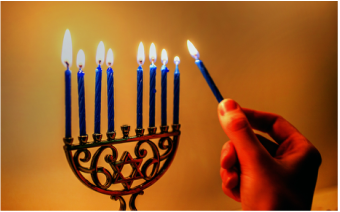 Several organizations in Northern Virginia offer events for the community to celebrate the high holidays, and Hanukkah of course is one of the most festive times. See our list below for menorah lightings, special Hanukkah celebrations, and other seasonal events. Please note many of these are outdoor celebrations, so dress accordingly for the weather. As always, check specific sites for schedule updates or inclement weather cancellations. If you know of a Chanukah event that is NOT yet listed here, please submit the details (including date, location, description, and official link) so we can add it. As always, we list community events that are family-friendly (all ages or most ages) and open to the public. Thanks! The Lighting Ceremony of the National Menorah takes place on the White House Ellipse at 2 pm. Gates open at 3:15 and the event is free, but tickets are required. This is a fun family festival with live entertainment by the United States Air Force Band and Dreidelman and the Macabees, plus menorah kits and dreidels, and hot latkes and donuts. The event is presented by American Friends of Lubavitch (Chabad). Chabad of Reston-Herndon is hosting a Chanukah Bowling Party for all at Bowl America! The fun-filled evening includes Chanukah bowling, a special Bowling Ball Menorah Light a surprise guest, a chocolate gelt drop from high atop a firetruck ladder and bucket, Chanukah treats, and more. Organizers request RSVP to secure enough lane rentals. This is an all-ages event, 4-6 pm. Admission is free and bowling with shoe rental is $13 per person. Join theThe fourth annual “Flip Like A Latke” event at Flight Trampoline Park is exclusively for Chabad and friends, from 6 pm to 7 pm. Additionally, there will be a special performance by nationally acclaimed Jewish Rapper Ari Lesser. The Jewish Community Center of Northern Virginia hosts this event for kids 10 am to 11:30 am. Make crafts, enjoy a sufganiyot decorating bar, PJ Library stories, and of course dreidel games; $6 for child (member) or $8 (non-members). Chabad Lubavitch of Northern Virginia and the City of Fairfax present a Chanukah Party from 5:30 pm to 7:00 pm at Old Town Fairfax Square. There will be a grand menorah lighting, music, crafts, doughnuts, and more at this free event. Join Chabad Lubavitch of Alexandria-Arlington to share in the spirit and Joy of Chanukah at The Grand Chanukah Menorah Lighting in Old Town Alexandria at 6:30 pm. This is a free annual community event, now at the Lyceum history museum, includes family entertainment, raffles, light sticks for kids, lively Chanukah music, and hot potato latkes, and chocolate gelt and dreidels for all. Admission is free. Celebrate the miracle of Chanukah with the Jewish Community Center of Northern Virginia at Mosaic District in Merrifield. The free event, 5:30-8 pm, includes songs, kids’ activities, and sufganiyot (donuts). Meet at Clarendon Central Park (at the Clarendon Metro Station) at 6 pm for the lighting of a giant 6-foot menorah. Enjoy lively Chanukah music, chocolate gelt and dreidels for all, and hot potato latkes. Sponsored by Chabad Lubavitch of Alexandria Arlington. Join Chabad of Northern Virginia at Atlas Walk (across from Starbucks, next to Grafton Street) at 5:30 pm for a Grand Menorah Lighting ceremony. The free event also features music, Chanukah delights (hot latkes & donuts), crafts, and chocolate coins for kids. See the kindling of Winchester’s largest menorah, make a Chanukah craft, and enjoy donuts, latkes, gelt, music, and fun in downtown Winchester. There will be a fire juggling show at 5 pm, followed by the menorah lighting at 5:30 pm, in front of the Old Courthouse on the pedestrian mall. The event is free and open to all. The National Museum of American Jewish Military History (along with the Jewish Study Center) invites you to a Hanukkah Party with latkes, jelly doughnuts, gelt, and songs. Explore the museum at 6 pm and then starting at 6:30 enjoy games, plus learn about facts and myths about Hanukkah and how Jews in the American military have continued the tradition of the Maccabees. Admission is free, with donations accepted; there also will be a collection of winter coats for veterans in need. This annual community event at Pentagon Row features ice skating, lighting of a giant 6-foot menorah, a free raffle, and food including kosher hot dogs, latkes. The lighting ceremony is open to all; activity fees are $10 in advance, $13 at the door or after December 3 (includes skate rental; food sold separately). Celebrate the start of the holiday season in Leesburg at the annual Christmas Tree and Menorah Lighting Ceremony on the Town Green. The event, with performances from local schools and a holiday sing-along, starts at 6 pm. Join the Village at Leesburg to celebrate the upcoming miracle of Hanukkah with Rabbi David Greenspoon of Congregation Sha’are Shalom in Leesburg. Activities will take place near the Menorah in Village Plaza, 4-5 pm. Chabad Lubavitch and Home Depot present this fun, hands-on workshop for kids. Craft your own Menorah and enjoy Chanukah treats, dreidels, and more. The free event is at noon; register in advance. This free event at the Reston Town Center has music, donuts, dreidels, latkes, and more, starting at 6 pm. The event is organized by Chabad of Reston-Herndon. Admission is free and the fee for ice-skating is $12.